Journal of Small Animal Practice 2012; 53, 182–184. While hypothyroidism is a common endocrine disorder in dogs, canine hyperthyroidism is rare. Like cats with hyperthyroidism, most dogs with naturally occurring hyperthyroidism have a functional thyroid tumor (1,2). However, unlike the situation in hyperthyroid cats, where most thyroid tumors are benign, almost all of these hyperthyroid dogs will have thyroid carcinoma. Therefore, the prognosis is generally guarded to poor. Exogenous hyperthyroidism, a result of excessive intake of thyroid hormones, is rarely recognized but generally results from excessive administration of L-T4 for treatment of hypothyroidism (1,2). In humans, however, excessive consumption of meat contaminated with thyroid tissue has resulted in exogenous hyperthyroidism (3,4). This report by Köhler et al (5) is the first to report this syndrome of dietary hyperthyroidism in dogs. To evaluate hyperthyroid dogs with high plasma thyroxine (T4) concentrations fed raw food, before and after changing the diet. Between 2006 and 2011, 12 dogs presented with an high plasma T4 concentration and a dietary history of feeding raw food. Plasma concentrations of T4 and thyroid-stimulating hormone (TSH) concentrations were measured initially and after changing the diet. Twelve dogs were presented with a median age of five years. The median plasma T4 concentration was very high at 156 nmol/L (≈12 μg/dl). In six dogs, thyroid-stimulating hormone concentration was measured and was low in five dogs and normal in one. Six dogs showed clinical signs consistent with hyperthyroidism, such as weight loss, aggressiveness, tachycardia, panting and restlessness; the other six dogs had no clinical signs. After changing the diet, eight dogs were reexamined and serum T4 concentrations normalized in all dogs, with resolution of all clinical signs of hyperthyroidism. Dietary hyperthyroidism can be seen in dogs on a raw meat diet or fed fresh or dried gullets (which include thyroid tissue). High circulating T4 concentration in a dog, either with or without signs of hyperthyroidism, should prompt the veterinarian to obtain a thorough dietary history. 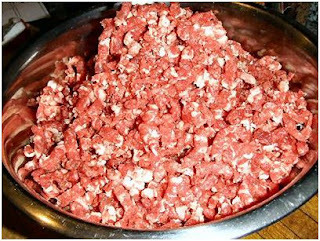 In man, community-wide outbreaks of “hamburger thyrotoxicosis,” resulting from inadvertent consumption of ground beef contaminated with bovine thyroid gland, have been previously reported (3,4). These outbreaks resulted in the banning of "gullet trimming," in which meat in the neck region of slaughtered animals is ground into hamburger. Because thyroid tissue is similar in color to muscle meat, it is possible for gullet trimmers to include the thyroid gland when meat is ground into hamburger or sausage. People, and presumably pets, that eat such contaminated hamburger or gullet tissue can ingest doses of thyroid hormone sufficient to induce disease. Since none of the dogs in this report were being supplemented with L-thyroxine, the most likely cause of their high T4 concentrations and clinical signs of thyrotoxicosis was the feeding of a meat diet that had been contaminated with thyroid tissue. The fact that all dogs improved after stopping the diet is also in agreement with that premise. The rationale behind the concept of BARF (an acronym for Biologically Appropriate Raw Food) is that this is the type of diets dogs were programmed to eat during their evolutionary development (6). Therefore, the BARF diet represents a biologically-appropriate food for dogs, rather than cooked or processed foods. With a BARF diet, the perfect meal would contain muscle meat, bone, fat, organ meats, vegetable and fruit materials combined in precisely the correct balance, just as nature intended. In the dogs of this report, it is obvious that the correct balance was not maintained and a very large amount of raw thyroid gland tissue ended up in their raw meat diet. As is the case with the exogenous L-T4, these natural thyroid hormones are not destroyed by gastric acid and can then be absorbed, leading to high concentration of circulating T4 and clinical sign of hyperthyroidism. Our Doxie of 14 yrs has been diagnosed with high levels if T4 or hyperthyroidism. Our vet says he has NEVER treated a DOG with this, many hypos, but no hypers. He eats a diet of dry and canned food that is grain free(Wellness Core) Could that possibly be the cause? He exhibits no symptoms of hyperthyroidism. It would be very unlikely that commercial canned food would be contaminated with thyroid tissue and lead to hyperthyroidism. I'd recommend rechecking your dog's T4 value or doing a complete thyroid profile (total and free T4, T3, TSH, and thyroid autoantibodies). Our 11 year old boxer mix mutt just tested with high free T4 (4.8 ug I believe?) He has been on a raw beef diet for several years, which includes ground neck bones. Our vet had not heard of this study, but we are hoping this is the cause. I'm wondering how long we should wait to expect to see a change if we switch his diet. He does not have any palpable masses in his neck or throat area, but I realize that does not rule out cancer. Our vet first thought an u/s was the best course of action, but after I shared this study with him, he said we could consider switching the diet and seeing if symptoms abate. I just don't want to do so if indeed he has cancer and needs immediate treatment. Many dogs without hyperthyroidism can have a falsely high free T4 value, so it's most important to look at the total T4 value. That said, a value of 4.8 µg/dl would be the right units for total T4, not free T4. In any case, if your dog is actually hyperthyroidism due to the diet, the T4 or free T4 should come down to normal within a week or two after a diet change. Thanks very much for your reply. They did test both total T4 (it was 4.4 with a reference range of 1 to 4) and free T4 (it was 4.8 with a reference range of 0.6 to 3.8). Our vet has admittedly very little experience with hyperthyroid dogs, so he isn't really the best reference in helping us make decisions about what to do. We are hoping that a modified diet will have clear, fast and obvious results so as to make our next steps more easily decided. The vet thinks this is a fine choice to make in the short term - do you think we should be more aggressively testing for tumors, and, if so, what tests would you recommend? (As a note, we also have never done any thyroid tests on the dog before - my husband feels that it's possible the dog has always run a little high. Only current symptoms are difficulty gaining weight, increased water and peeing, and occasional bouts of increased panting. I can't be sure, but it seems to me that perhaps since changing the diet on Monday we are already seeing some of the symptoms abate, but I can't be sure - it may just be wishful thinking. What tests do you recommend as follow up when a dog without a palpable mass tests high for T4 levels? Your dog's clinical signs certainly go along with hyperthyroidism (increased thirst and urination, panting, trouble gaining weight). I'd wait another week and then repeat the total T4 and free T4 as a start. Hopefully, those values will be normal and we can stop the workup. You husband is correct to some degree: all dogs have their own "normal range" so he might have also had slightly higher-than-normal thyroid values. But that explanation cannot explain the clinical signs. So if the T4 and free T4 levels remain high, the you might consider doing a complete thyroid profile, which also includes a T3, TSH, and thyroglobulin autoantibody levels) to better evaluation thyroid function. Chest x-rays should also be done in any dog with hyperthyroidism that doesn't appear to be dietary related. A thyroid scan would be helpful to identify where the thyroid tumor is located. Our 2 dogs, a 2 1/2 year old shih tzu/maltese mix's and a 3 year-old maltese's CBCs came back with elevated T4 levels. Originally my vet thought it might just be stress related because they had anxiety at the vets, but after my younger one started panting more frequently and scratching, i brought her back to the vet for a full thyroid panel. On the thyroid panel, her T4 levels were elevated as well (4.46). My vet believed it might be dietary (I feed them a homemade diet) and told me to take out 1/2 the salmon that I include and to take out 1/2 the kelp as well and recheck both of them in a month.i just brought them back last week. my older dog's levels went back to normal but my younger one's level are still high although they went down to 4.1. I asked him if we should scan her for tumors, and he said to bring her in Monday but he still believes its dietary. He said to remove the fish altogether and the kelp (maybe she's more sensitive than the older one ( because i also supplement her diet with Omegas 110 mg). He wants to see if that brings down her levels. Is there anything I should eliminate from her diet that might be causing this? Also, she has always been a finicky eater and sometimes she is not interested in eating, especially during travel. For awhile the vet had prescribed Periactin to help stimulate her appetite and she had that daily from Aug 2012 til around a month ago (during the CBCs and the full thyroid panel) she was on it. But I took her off it a few weeks ago (about 2 weeks) before this last test. Could that be effecting her levels? You need to measure a complete thyroid panel to help sort out if this is even a problem. I'd recommend a T4, free T4 by dialysis, T3 and TSH level. Some dogs with "normally" have a T4 that is borderline high. If hyperthyroidism is really present, the appetite should be increased and weight loss is common. Hyperthyroid dogs should not have a decreased appetite. How long might it take for a dog diagnosed with hyperthyroidism, probably due to raw diet, whose presenting symptom was excessive panting, for this symptom to go away once all thyroid levels have gone back to within the normal range? His levels went down after about 3 weeks on a kibble diet. He was tested at Hemopet and also at MSU. Time will vary, but most symptoms of hyperthyroidism should improve or resolve within 2-3 weeks of T4 and T3 returning to normal range limits. I believe my dog may have hyperthyroidism and I'm wondering what to feed her to help her pack back on the weight. Currently she eats regular store bought dog food but she has lost all body fat. Hyperthyroidism is a serious disorder that cannot be treated with diet alone! Talk to your vet about a workup. Thank you very much for your research and individual responses. I am an admin of a New York raw cat and dog feeding group and trying to get an answer. As you may be aware, there is so much conflicting information out there. So, my question is if the risk of thyroid is limited to beef ( as many studies seem to imply) or does poultry ( chicken , duck, turkey) also pose a risk? I have seen in multiple places that poultry does not pose the same risk. Thank you in advance for your time and response. Debi Stokes, Admin Raw Feeding for Dogs & Cats / NYC and vicinity. All animals have a thyroid gland, and the chemical structure of thyroxine is identical in all animals. It doesn't matter if it's beef, pork, or poultry. The key is if they included the neck muscles (and thyroid gland) at time of processing. Now it is very likely that they may be more likely to do this with beef than poultry but I don't know.